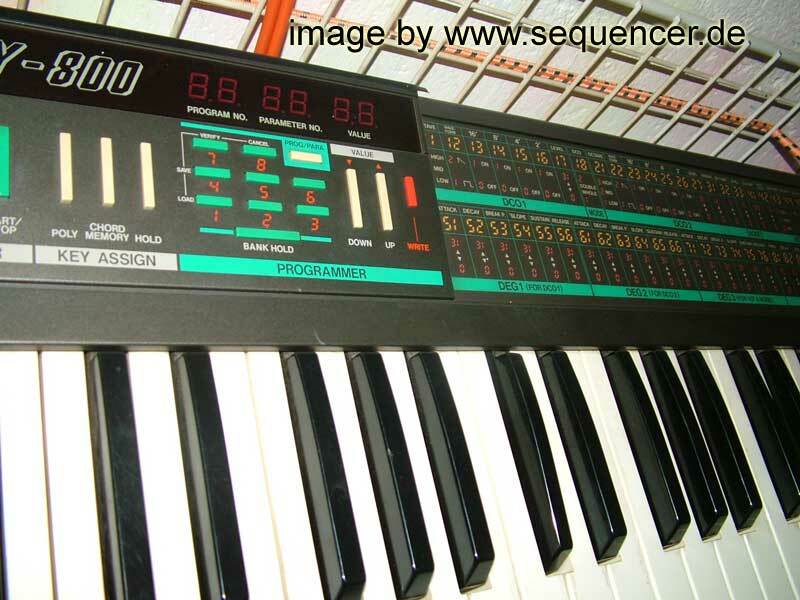 normally the dw 8000 is in poly mode only. has velocity response. 2 special eg: ADBSSR envelopes! 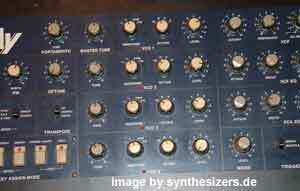 but dw6000 and dw8000 have analogue filters! 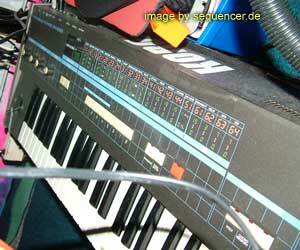 the microkorg & ms2000 are of course VA / digital! – back to DW arpeggiator on board, too! 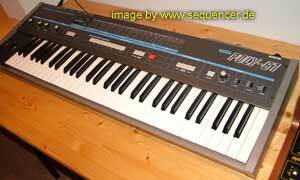 one lfo (called mg (modulation generator) on korg synths). 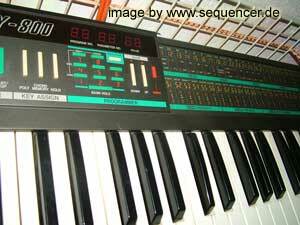 released in 1985. btw: the original dw series had 16 dwgs waves, the ms2000 / MS2000R and microkorg got lots more! btw: if you turn the dwgs knob you can get a nice „wavetable-like“ sound scan. 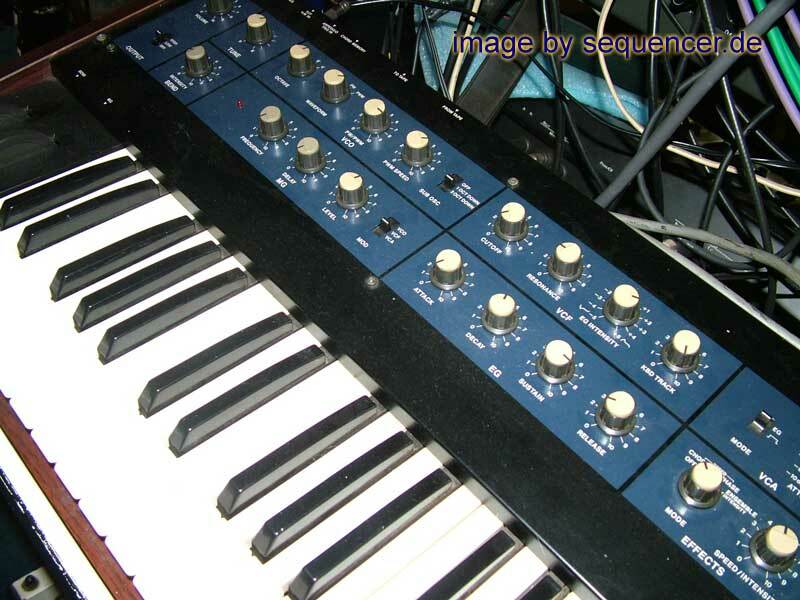 the microkorg/ms2000 (same engine) also allow symmetry of all waveforms (saw etc..) with pulse it is called PWM ;) there is also the fm mode, it does not allow all waveforms, so you can have sine and the basic waveforms for fm. still cool for a lot of sounds. also able to ringmod and sync the oscs or both!.. 4 mod routings allow to change parameters by velocity. the real cool thing is the „arpeggiator“ (more than that), where you can set every of the 8 (16 on the ms2000) „steps“ like the roland TR drum machines. the number of waveforms are different. note (DW8000): there was a nice expansion to the dw8000’s midi and keyboard capabilities..
it’s basically adding split modes and „2x multitimbrality“ features and master key stuff (local off) and a random waveform (DWGS wave) and more memory..
(D) für den DW8000 gibt es eine kleine erweiterung für splitten des keyboards /damit quasi 2fache multitimbralität) und eine random wellenform, mehr speicher und local off ,damit man den dw auch als masterkeyboard nutzen kann..
Korg Polysix: (one Osc + subosc) only but a nice „FX“ section (chorus/ensemble).. not too fat but ok… those times.. same filters and envelopes like the MonoPoly (SSM) aaand..
Polysix – the one osc’ed monopoly sister. 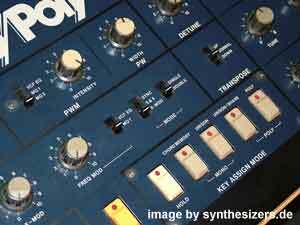 but it had a nice „FX“ section: means – chorus, ensemble etc.. not really fat.. but nice pads can be done.. no resurrected within „legacy“ as one of 3 emulationsthe korg mono/poly is a 4 VCO synth with crossmod (between 2 VCOs) and sync. quite a good bass synth but the env generator is not the fastest on earth.. it was able to be played as a 4 voice polysynth but with one filter only. as the new vermona per4mer (see vermona on this page!) has a similar philosophy but with 4 real synth sections. 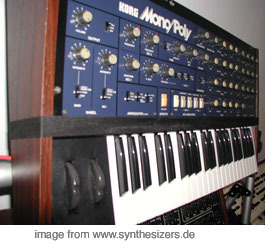 so the monopoly was used as a faaat bass synth or late „minimoog“ competitor (well, it never reached that sound.. but was very interesting)..
it’s been said that korg seemed to have used the wrong pots: they have linear potentiometers inside, if you replace them by exponential ones the ENVs will be much faster! below: thats, how you can mod the MonoPoly if you don’t care about „respect“ to design ;) no keyboard. It has a nice set of Parameters for it’s 3 ADBSSR Envelops hardwired to Pitch, Filter and Amp.The Poly 800 II has an extra digital Delay. 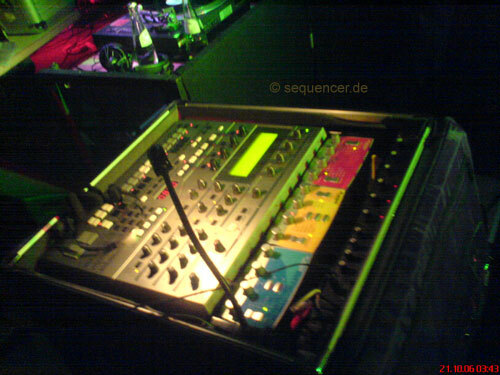 A rack version is available as EX800. 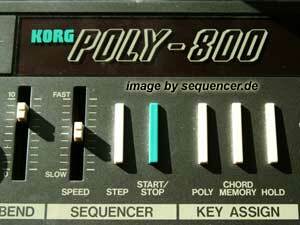 Some poly800 have a nice modification to tweak cutoff and resonance. 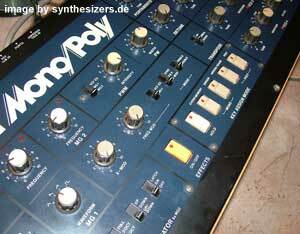 There are some Poly 800 and Poly800II with inverted keyboard out there.. 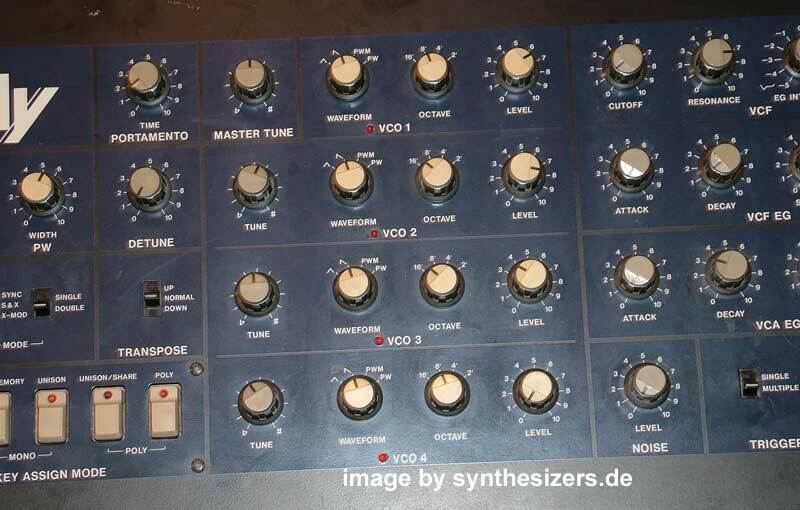 There is a Sine Wave driven LFO aboard, too.. All versions have a simple 256step Sequencer an board but the note length can not be set.. so it is quite limited.. „nice to have“ no more..
click to enlarge – thanks to acidmoon for poly800 pics! The Korg Poly800 is a small 2 DCO Synthesizer. It is 4 note polyphonic when both are in use, 8 notes @ only 1 DCO running can also be used but: You only got ONE VCF for all Voices! It’s Waveforms can be used simulatneously at any of its Octave Settings. So it is not bad and sort of „additive octave“.. Memorizes 64 Patches. 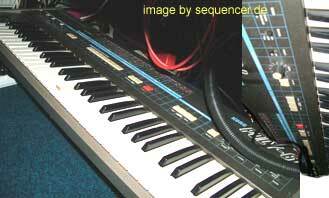 later a Poly61M with midi and a midi retrofit kit was released but quite simple implementation – VERY SIMPLE!! nice arpeggiator. sort of digital polysix but no ensemble or chorus effect. enlarge Poly-61 to see the parameters..
AMF Modular? it’s a computer!